Are you owl lover? Do you like birds? Then this cute owl on a branch tree from our owl wall stickers collection is perfect for you. Decorate any space at home and give your room a more personalised look with a fun atmosphere that everyone will enjoy. If you are tired of those empty walls then you could definitely use some of our stickers! This is perfect if you love nature. An illustration of an owl with a big heart sitting on a branch. You can also decorate the bedroom or playroom of your children. 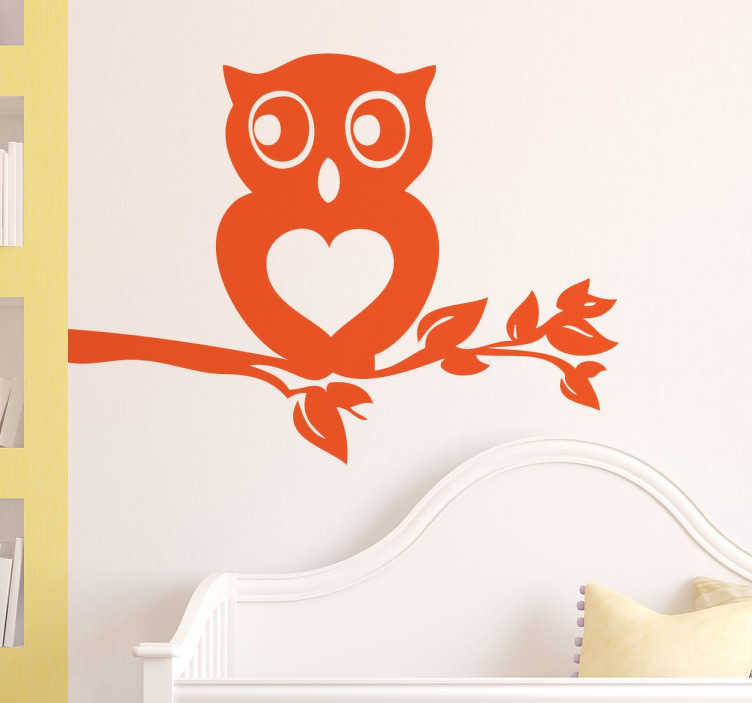 If your toddlers love birds then they will be over the moon with owl wall art decal. This owl with a big heart is available in various sizes and in 50 colours. Stickers made from high quality vinyl. Easy to apply and easily removable leaving no residue. Suitable for decorating walls, windows, vehicles, appliances, devices and more.